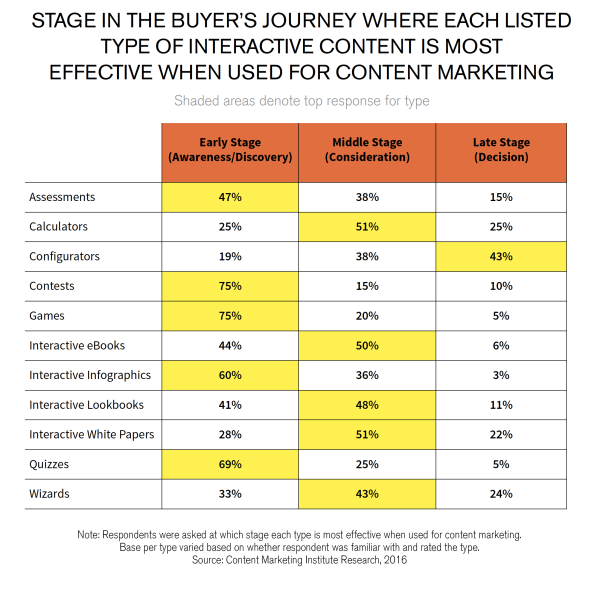 Do you use interactive content to influence the buyer’s journey? Fifty-three percent of content marketers we recently surveyed said they do. And what do you think is their top reason for doing so? You may suspect that it’s engagement (I know I did). I was pleasantly surprised, however, to see that educating the audience was the No. 1 reason (75%) for using interactive content. Sure, 59% said engagement, making it the No. 2 reason (followed closely by lead gen and brand awareness), but educating the audience — one of the key tenets of content marketing — reigned supreme. Here are some other key findings from the Content Marketing Institute white paper Deliver Peak Experiences With Interactive Content sponsored by ion interactive. The paper presents the results of a survey CMI conducted earlier this year, along with best practices for using interactive content for content marketing purposes. Fifty-one percent of respondents have been using interactive content for three years or longer, with 14% using it for seven years or more. Marketers with three or more years of experience reported that interactive content made up, on average, 23% of the total marketing produced by their organization in the last 12 months (versus 18% for the overall sample). 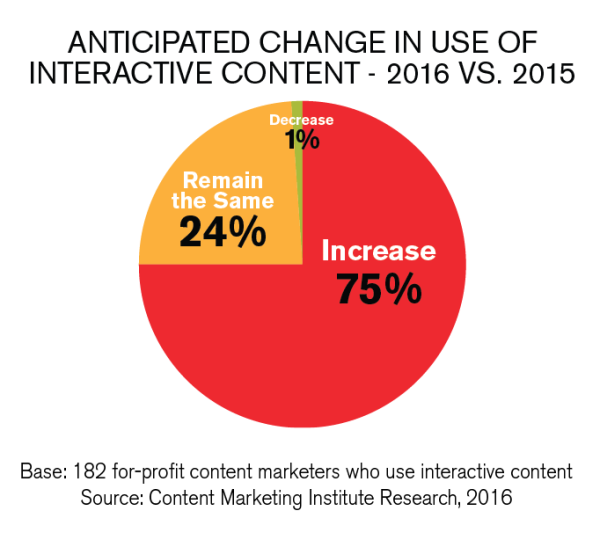 Seventy-five percent of respondents who use interactive content said they anticipated that their organization’s use of it would increase in 2016, compared with 2015. The survey inquired about the use of 11 types of interactive content for content marketing purposes. Assessments were the most-cited type (54%), followed by calculators (52%), contests (50%), and quizzes (48%). We also asked respondents at which stage of the buyer’s journey they found each type of content to be most effective. Contests and games were the most highly rated types for the early stage (awareness/discovery), educational types were most highly rated for the middle stage (awareness), and configurators were most highly rated for the late stage (decision). 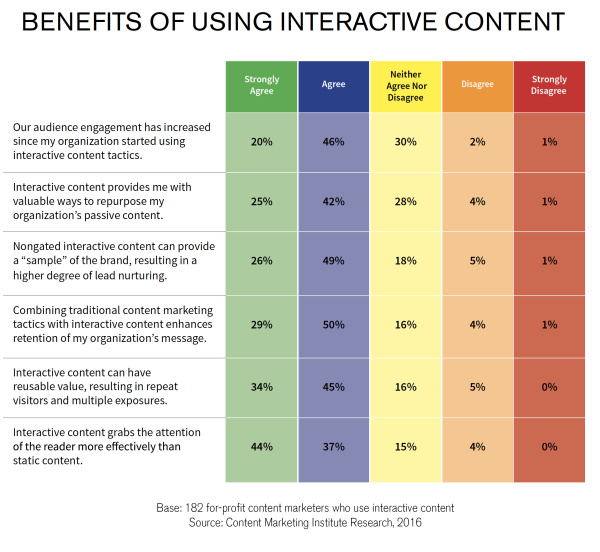 Why don’t marketers use interactive content? Respondents who said their organizations are not currently using interactive content cited lack of staff/bandwidth as the top reason (55%). Lack of budget (38%), lack of technical expertise (31%), and still researching it (31%) followed. Fifty-two percent said tools to simplify the process would encourage them to use interactive content, followed by education on how to use (45%), best practices (42%), and ease of use (42%). How effective is interactive content at helping organizations achieve their content marketing goals? Beyond landing pages, where are marketers using interactive content? What methods do they use to measure the results of interactive content? 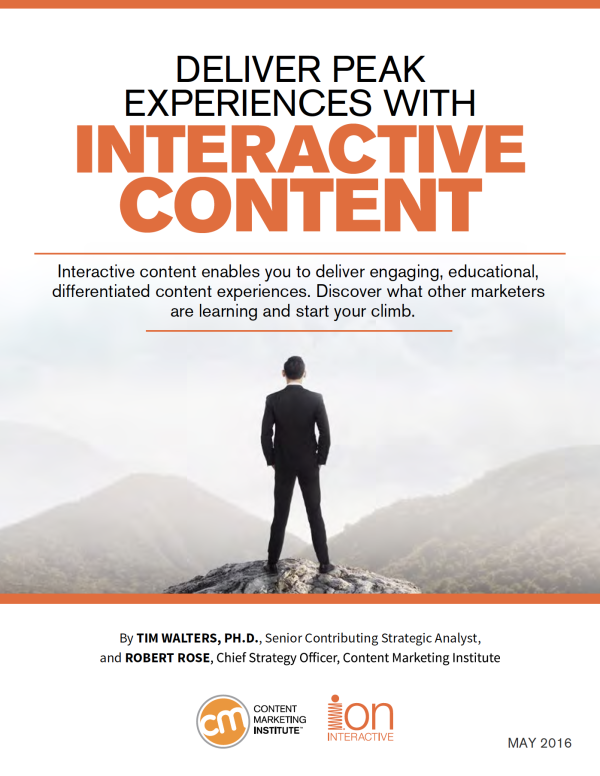 In addition, the authors, CMI’s Robert Rose and contributing analyst Tim Walters, offer guidance on getting started with — or expanding your use of — interactive content for content marketing purposes. To glean insight from this and other research, visit our custom research page. What has your experience been with interactive content? Let us know in the comments. Want to interact with expert insight on content marketing? Subscribe to the daily or weekly CMI newsletter.